The Local Lupus Alliance is helping to raise awareness about rheumatic diseases in La Crosse, WI this September during the first annual Rheumatic Disease Awareness Month, sponsored by the American College of Rheumatology (ACR) and its national public awareness campaign, Simple Tasks. More than 52.5 million Americans – young and old – live with painful, debilitating, and life-threatening rheumatic diseases, including rheumatoid arthritis (RA), gout, lupus, Sjögren’s syndrome, ankylosing spondylitis, and juvenile idiopathic arthritis. maintain a normal quality of life. The mission of the Local Lupus Alliance is to raise awareness, educate and assist patients and others who have been adversely affected by Lupus within our community and surrounding areas, grow partnerships and collaborate to bring about compassionate care and healing. “No one should have to live with chronic, persistent, and mysterious pain,” said Dr. Joan Von Feldt, MD, MSEd, president of the American College of Rheumatology (ACR). “Seeing a rheumatologist within the first weeks and months of disease onset – what rheumatologists call the ‘window of opportunity’– can dramatically improve long-term outcomes for patients, so it is important to know what symptoms to look for and when to ask for a referral to a trained specialist.” Once diagnosed, people living with rheumatic diseases can face significant healthcare obstacles, including a shortage of trained rheumatologists to treat their conditions and expensive co-pays for specialty therapies. “Unfortunately, too many of our patients struggle to access and afford effective care and treatments for their rheumatic diseases,” said Dr. Von Feldt. 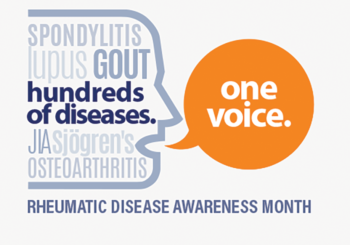 “Therefore, in addition to increasing awareness about symptoms and treatment options, Rheumatic Disease Awareness Month is also an opportunity to advance the health and well-being of those living with rheumatic disease byadvocating for healthcare policies that help patients access safe, affordable, and effective healthcare.” Rheumatic Disease Awareness Month is sponsored by Simple Tasks, a national public awareness campaign from the American College of Rheumatology (ACR). People who are interested in learning more about rheumatic diseases and Rheumatic Disease Awareness Month activities are encouraged to visit the Simple Tasks website at www.SimpleTasks.org. The Local Lupus Alliance is a 501c3 nonprofit in La Crosse Wisconsin. Lupus is a chronic, autoimmune disease that can damage any part of the body (skin, joints, and/or organs inside the body). There is no cure, and it can be fatal. The Lupus Foundation of America estimates that 1.5 million Americans, and at least five million people worldwide, have a form of lupus. The Local Lupus Alliance exists in the Coulee Region to connect those suffering from lupus. The LLA is an organization that offers patients a way to share their struggles, ask questions and find answers, celebrate victories, and support one another all while finding a way to cope with their illness. It is also a place for families, friends and others to support loved ones, participate, donate, sponsor and/or volunteer. The American College of Rheumatology is an international medical society representing more than 9,400 rheumatologists and rheumatology health professionals with a mission to Advance Rheumatology! In doing so, the ACR offers education, research, advocacy, and practice management support to help its members continue their innovative work and provide quality patient care. Rheumatologists are experts in the diagnosis, management, and treatment of more than 100 different types of arthritis and rheumatic diseases.